Once again I ended up with four bentos this week. 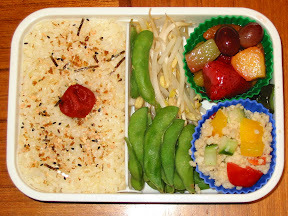 Only this time it was due to an unexpected company lunch, resulting in a delayed bento and no need to make one the next day. If they ever do that to me on Friday...well it's not like it's ever hard to find something to do with good food. 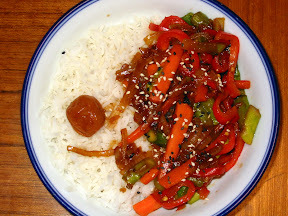 I had my leftover copy of the shirataki noodle dish for dinner Friday as it was. Sunday night I think I took ill, but had already overcome the shivery fever symptoms by morning. 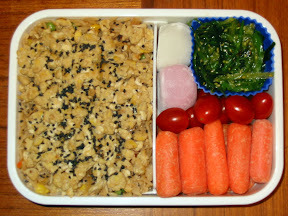 I wasn't too sure what would happen next, so I went with a fairly bland bento. I don't know if the carrots are already starting to show their age (the one horrible disadvantage of pre-cut baby carrots) or if my taste buds were off, but half of my carrots tasted horrible. 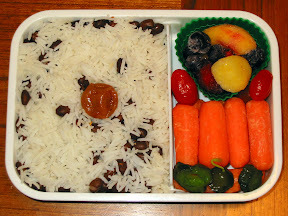 The rice and kidney beans is approximately what it sounds like when you just put them next to each other like I did. Nothing special. 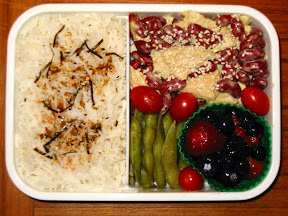 This bento isn't really one I'd recommend unless you do want something bland. I'd picked up these noodles a while ago. They're really convenient, since they don't need any additional cooking, they don't have a strong flavor so they can go with anything, and they're just ready to go even after a week in the refrigerator. Just drain them, cut them down to a manageable size, and enjoy. And don't forget to cut them. I can barely remember Wednesday of last week; I think the interesting news on Thursday must have wiped it out of my head. 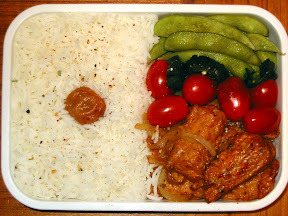 However I do remember this bento. I was tired of rice, and far too interested in whether making lentils in the rice cooker would work out correctly. So I tried. It does. Next time I just need a better plan for how to use said lentils. This was yummy, even a day late, and a bit more chilled than I'm used to. It seems that my holy trinity combination of flavors is the soy-sauce, mirin, rice-vinegar, miso combination I keep using. It goes really well on chicken, tofu, probably even on fried rice but I've not tried yet. A teaspoon or so each, maybe as much as two teaspoons of soy sauce, provides much needed flavor, and works as well at room temperature as it does hot. This week was a little unusual, with both a snow day I worked from home, and a vacation day. Mind you, I'm not complaining about the time out of the office, but it does hurt the habit just a bit. 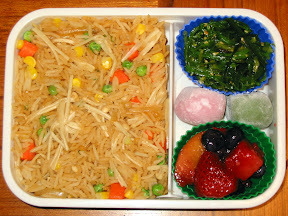 Monday I finally made a bento fried rice using onions, and threw in some enoki just for luck. Yummy! The newcomer to my lunch, aside from enoki, were a pair of dango. Specifically mochi an dango. I think. Either way I love 'em. 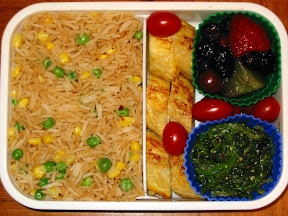 Tuesday was a simple brown rice and black bean main course, accompanied with some favorites. Today I used my newly acquired bamboo sushi mat to try to roll the tamago-yaki tighter. I think they came out a little better, but more due to improving my cooking process than due to the mat. Maybe something else will need the mat more later; for now, it seems like an unnecessary toy. Snow day! We had heavy snows starting on Tuesday (not unlike those starting Thursday the week before), so I decided to work from home on Wednesday to fight neither traffic nor winter. Actually I fought winter a bit, shoveling our driveway a couple times. As I write this entry nearly a week later, most of the snow we got then is still present on the sides of the driveway, and the sides of our roads, although of course some of it came later as well. Guess what - Thursday I unveiled my other recent new toy: kurogoma, or black sesame seeds. Under them are some eggs inspired by Just Bento's iri tamago recipe (but executed much more poorly). I was in a rush to create these and did them at my normal tamago-yaki heat and used a spoon. 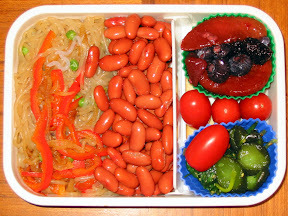 For the results shown on Just Bento's blog, I think you really need to use chopsticks, and perhaps a slightly lower heat. Under the eggs are leftover fried rice like Monday's. And mmm dango! Vacation! 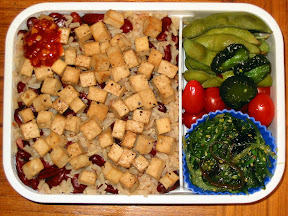 But I made bento-style foods outside of a bento anyway. 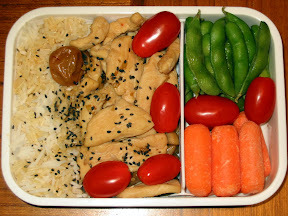 I'm really starting to want a two-layer bento box. I think it'll let me (and force me) to be a little more creative about the food I take, and I want that challenge. But I told myself I'd wait until at least week 6 to see if I was still doing this before getting any more boxes. One week left! 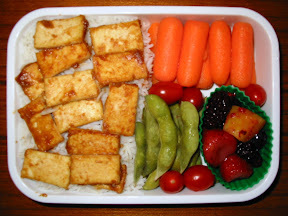 I think I'm learning less on a weekly basis now that I'm not completely new to bento, but there's still plenty of lessons that come up when trying new things. Like the iri-tamago failure (which was still yummy so I don't mind), or actually remembering to use onions in my fried rice. Sometimes when I end up making bland food I wonder if I'm doing something wrong, but then I just think back to the sandwiches this has replaced, and I'm quite happy with the trade. Life's too short to eat turkey sandwiches every day! Monday I mostly finished off left-overs, but treated myself to some sliced cucumber this time. The ume is grand, as was the stir-fry. It's kinda funny that all these years I've disliked smaller onions because I was cooking dinner for three or four people. But now that I'm cooking lunch for one, they're perfect. Also, instead of my usual two-egg tamago-yaki, I made a three-egg because there were three eggs left in the carton. That'll save me some time tomorrow. This miso-chicken over rice on Tuesday was awesome. There's nothing like upping the flavor of cooked chicken with a little miso. 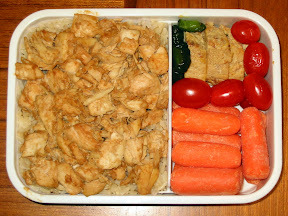 But I'm out of my usual add-ins, so this bento was a little more boring than usual after the chicken. 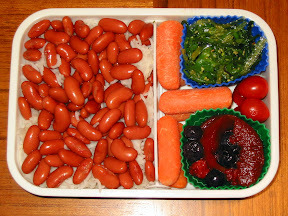 Wednesday was this week's bean day! Nothing special to report. Except that I'm still out of my usual add-ins; maybe I'll stop at a store and pick something up... I pulled some fruit out of the freezer this morning, and while it does wonders for the fruit's appearance, it's certainly much less convenient. 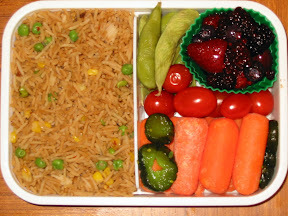 Time for a change - enough rice bentos! 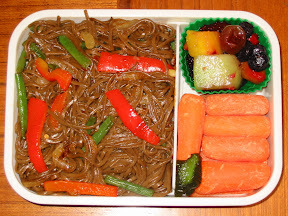 Thursday I made a soba bento, inspired by poor memory of yakisoba recipes, and made without consulting any. It was tasty goodness, but I don't have a clue how close it was to a real yakisoba. Probably almost nothing like it, really. 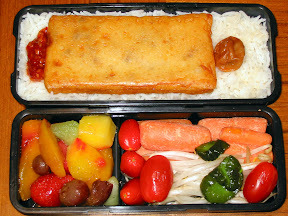 Since it was snowing something fierce, I didn't head to any good bento supply stores on the way home. Vacation! After the wonderful drive home Thursday night, slip sliding around on snowy roads, I wasn't particularly interested in going to work. I worked from home, and was too lazy to make a bento. Perhaps four a week is better for me. As I write this the following Monday, they're talking about a reprise of the snow storm Tuesday-Wednesday. Lucky us! 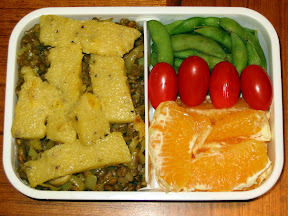 Week 3 would have been fairly uneventful, but I experimented with some new easy-addins from a Japanese grocery. 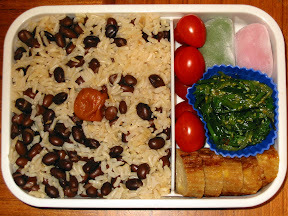 What can be better than starting off the week with a bento that doesn't take any work? 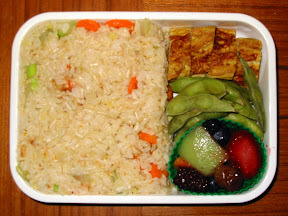 I had leftover fried rice, which I reheated on the stove and put in the bento. 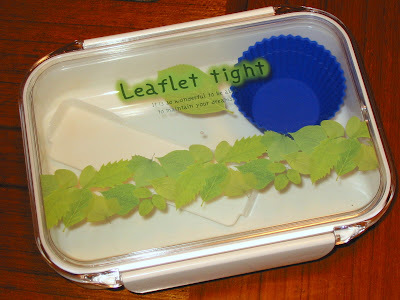 The remaining vegetables and fruit were similarly easy to collect and took no extra preparation. Tuesday was time for some new tastes. When I visited a Japanese market Monday night to pick up some more Mirin, I also picked up a small package of umeboshi and a small tray of "fish cake (kakiage tempura)." I have memories of being in Japan years ago, eating an onigiri, and wondering what was burning my mouth so badly. It wasn't wasabi—I would have recognized that. Later I decided it was an umeboshi. Ever since then I've been curious and now I finally tried ume again. They're really strong, but decidedly sour instead of hot. Maybe I'll never know what was in that onigiri after all. The fish cakes are just simple and good; the flavor reminds me of something my grandmother would make for us, but I can't put my finger on what. 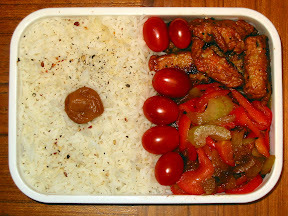 Tempted by the Sweet pepper and onion confit from Makiko Itoh's Just Bento, I made my own quick slapdash version Wednesday morning. Actually I sliced up the vegetables the night before and threw them in the fridge. It made the cooking a little faster in the morning, but not enough to brag about. It might be worth fully making ahead of time, but that seems like so much effort. I finally used up the chickpeas I'd opened the other week. They were still fine. Some mushrooms, onions, and oregano joined the party making for a flavorful interlude. Throwing in my recent standard ume and fish cakes, I was set for Thursday. I think perhaps I used a little too much oregano in the chickpeas, but it wasn't a bad combination. Friday we had decided to go out for lunch at work, so I just made some soup. 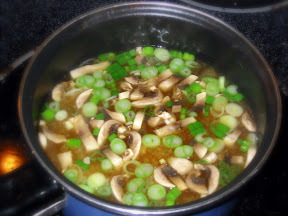 Given how much I like miso soup, why do I make it so rarely? I tried taking it to work in a thermos I had gotten for free on some coffee deal. Now I know why it was free. I ate the soup fairly early and it had already lost a lot of the heat. The day was cold too, but I don't count that as an excuse. Maybe week-by-week is the way to do this. It seems to better match when I have the energy to write it up, at least. 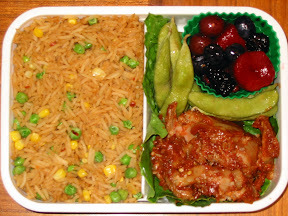 My second week of bentos was primarily more of the same from the first week, but with a new partner: Yvo's Kickin' Chicken, which I made with an approximate 2/3 recipe of RecipeGal's BBQ Sauce. All in all I didn't learn as much this week. I did learn that turmeric needs to be cooked into the rice if you're going to bother, and that Kickin' Chicken deserves the reverence Yvo continually pays it. And that sesame seeds are still fun, even if they make the pictures larger. Monday I kept some simple favorites, and tried out the Kickin' Chicken I'd prepared Sunday night. 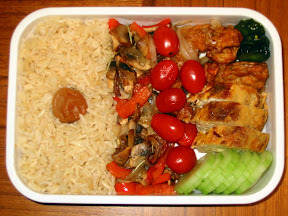 It was yummy, and the plain rice was the perfect foil for the strong BBQ taste. Speedbump #1: We used up all the grape tomatoes, which I love so much, Monday night and hadn't replaced them yet. Tuesday I had gotten it in my head the night before to try some vaguely Indian spices, so I added ground cumin, coriander, and turmeric to already cooked brown rice. In retrospect at least the turmeric should have been added before cooking the rice. And perhaps I should have used some ground ginger as well. The Kickin' Chicken rescued it. Speedbump #2: Wednesday we were still out of grape tomatoes. I'd used up my seaweed salad on Tuesday (yay, no more missing toothpicks! ), only to find we'd also eaten all our baby carrots. I was way too tired to chop up real carrots, though, so I found a substitute. At least I'd thawed some more fruit. 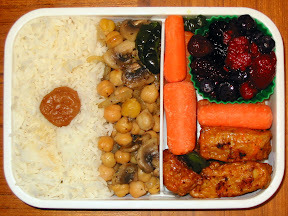 Note to self: I still need to use up the chickpeas I opened for this bento. What can I say? 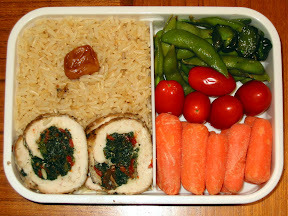 Thursday's bento is a clear combination of several of my favorites. I've loved fried rice for years, and Kickin' Chicken was my new love. No complaints, other than I really should chop up some onion for my fried rice—it's so flat without it. Apparently I got tired about ranting about software licenses and features I can't get into major free software projects because while I've got draft articles for both, they've sat untouched for a woefully long time. I've been working for four years now, doing C++ and related programming for most of it. While it hasn't killed my interest in side programming, it certainly has started to diminish the time I spend doing it. Of course, the bigger limiting factors are my recently expanded addictions: cooking, cooking, and more cooking. Last Thanksgiving we went out for Thai instead of our traditional family gathering. But two days before that my dad's cousin and her husband were in town; I had nothing better to do, and offered to cook dinner for them. My mom was working late, so we scheduled a late dinner. I started working around 14h. It was a blast. I made watermelon-cranberry sorbet, apricot muffins, rosemary bread, Tuscan bean soup, whole wheat pasta, and a tomato pasta sauce (cursing content, but I love his style). The next day I made watermelon sorbet, and Friday I followed up with a pair of deep dish pizzas. What a great week! Then I decided to write a cookbook. To do this I felt the need to write my own PDF layout engine (more on that some other time) so at least there's some python left in my life. It's a personal cookbook, so I'll try to post most of it up here. Winter break I went on a bit of a dessert spree for a small party I hosted. I made a vanilla berry pie on an oatmeal crust, fruit tartlets, and hot chili bean dip for chips. 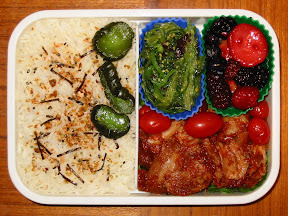 About the same time I started drooling over feistyfoodie's bentos. 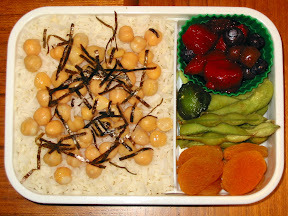 I read a few other bento blogs, and finally shopped at our local Mitsuwa for a bento box. 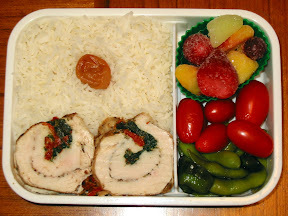 The supplemental muffin cups I got from Bed Bath and Beyond are perfect for the bento job. 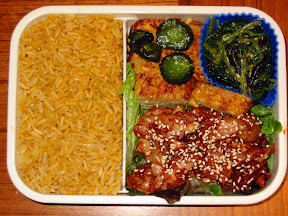 Now six lunches in I'm hooked on bento.